Shrubs, subshrubs, or facultative annuals, ± erect, 2-15 dm. 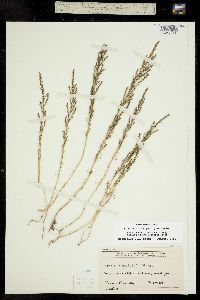 Stems spreading or erect, branched, woody stems brown to gray-brown, herbaceous stems green to dark red, usually woody at base, usually glaucous, glabrous or loosely hirtellous to villous, leaf scars on woody stems ± smooth; branches spreading. Leaves ascending to widely spreading, sessile or flat-petiolate; petiole ± 1 mm; blade glaucous, linear to narrowly lanceolate, subcylindric to flattened, (5-)10-30 × 1-2 mm, apex obtuse or acute to acuminate, glabrous or loosely hirtellous to villous. 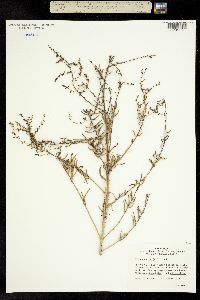 Glomes usually confined to distal stems and branches, 1-12-flowered; branches 0.4-2 mm diam., thinner than vegetative ones; bracts usually shorter than leaves, 3-15 mm. 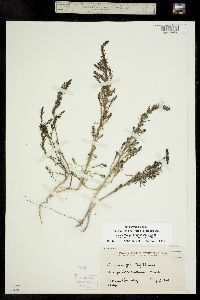 Flowers mostly bisexual, sometimes pistillate and/or staminate; perianth 0.7-2 mm diam. ; perianth segments connate proximally or to middle, glabrous or pubescent; ovary ± vase-shaped with distal necklike extension; stigmas 2-3. 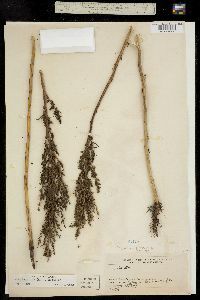 Seeds horizontal from bisexual flowers or vertical from pistillate flowers, not distinctly dimorphic but variable in size and color, 0.5-2 mm; seed coat black or brown. 2n = 18. Flowering summer-fall. 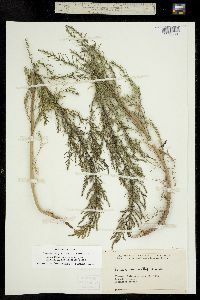 Alkaline, saline, and gypseous places of the interior, mostly in deserts, occasionally coastal, rarely estuarine; 0-1600 m; Alta., Sask. ; Ariz., Calif., Colo., Idaho, Mont., Nev., N.Mex., N.Dak., Okla., Oreg., S.Dak., Tex., Utah, Wash., Wyo. ; Mexico. 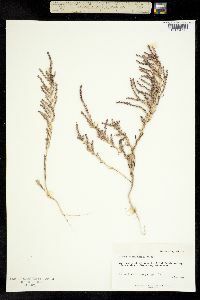 Suaeda nigra is the correct name for the species previously known as Suaeda moquinii. 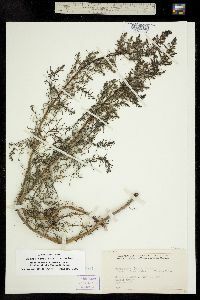 The type specimen was collected in 1820 by Edwin James along the Canadian River in the Texas panhandle. 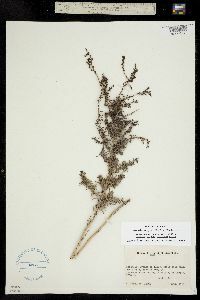 J. Torrey (1827) tentatively identified it as 'Chenopodium maritimum L. -'. 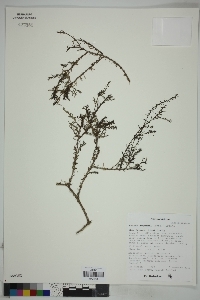 Rafinesque named it Chenopodium nigrum, long before Torrey´s publication of the name Chenopodina moquinii in 1856. 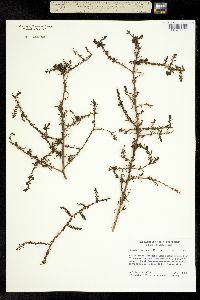 C. O. Hopkins and W. H. Blackwell (1977) suggested that the name Chenopodium nigrum was both a nomen nudum and a superfluous name. 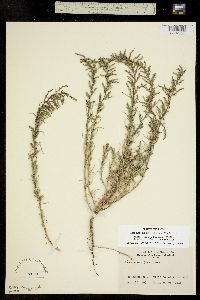 But the publication of that name included a clear reference to Torrey´s 1832 publication, which means that the name was not a nomen nudum, and the specimen belonged to a new species, which means that the name was not superfluous. 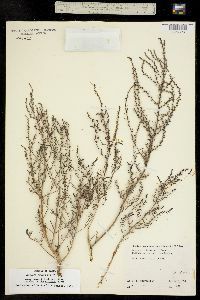 'Suaeda fruticosa' with the incorrect author combination (Linnaeus) Forsskål has been misapplied to this species (H. J. Schenk and W. R. Ferren Jr. 2001). Suaeda nigra exhibits much phenotypic plasticity, as well as genetic variability, and is wide ranging. 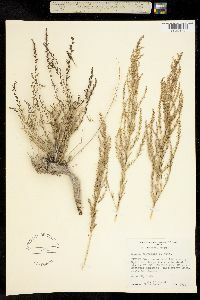 This combination has resulted in the naming of many variants that often reflect a response to localized or regional habitat conditions such as degree of wetness, salinity, or freezing temperatures (C. O. Hopkins and W. H. Blackwell 1977). 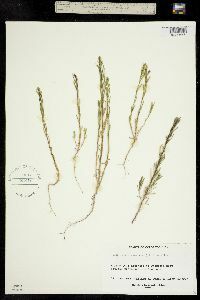 In California and adjacent states, for example, glabrous plants (S. torreyana var. torreyana) and pubescent plants (S. torreyana var. 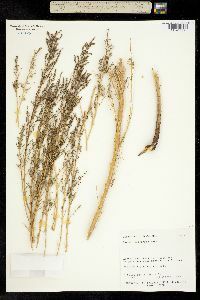 ramosissima) occur throughout the distribution of the species. In California it is coastal but not estuarine in the San Francisco Bay area and in Orange and San Diego counties. Plants of northern latitudes or higher elevations that are prone to freezing tend to have annual stems from a woody base. Plants that occur in more southern or milder conditions are usually shrubs with perennial stems. Plants in seasonally flooded wetlands tend to be facultative annuals. 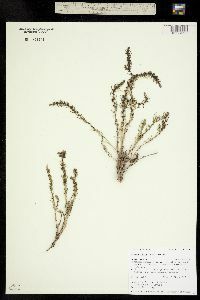 In the western and northern part of the range, most plants of Suaeda nigra are glabrous or sparsely pubescent and more or less long leaved. 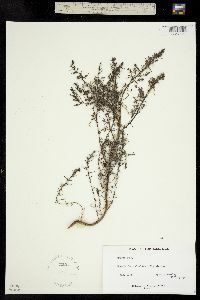 In parts of Texas and New Mexico and south into Mexico, densely villous, short-leaved plants occur, often on gypseous soils; they have been called S. suffrutescens var. 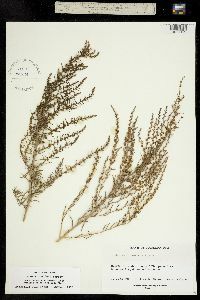 suffrutescens, and var. detonsa when the flowers and leaves are glabrous. 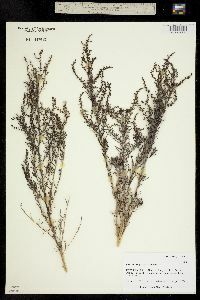 Plants from Texas with thickened and persistent leaf bases and corky-thickened segments of the fruiting perianth have been called S. duripes, known from only two collections that probably represent environmentally stressed individuals. Also in the Southwest, plants that are more herbaceous than S. suffrutescens and have a darker color have been called S. nigrescens.